I genuinely don’t use puns this often in actual speech; there’s something about needing to throw a title on a post, though, that turns me into my worst self. I actually ran a search through previous posts to be sure I hadn’t already used “Prime Time.” I wouldn’t have put it past me. 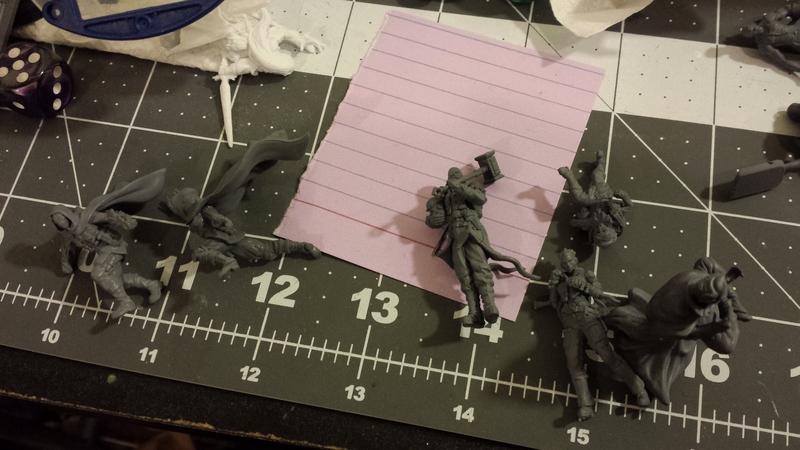 These will be bases for Hamelin’s crew, perhaps as soon as tomorrow. Ms. Feng and her people. Those are two Nurses and two Hanged next to the Rail Golem. 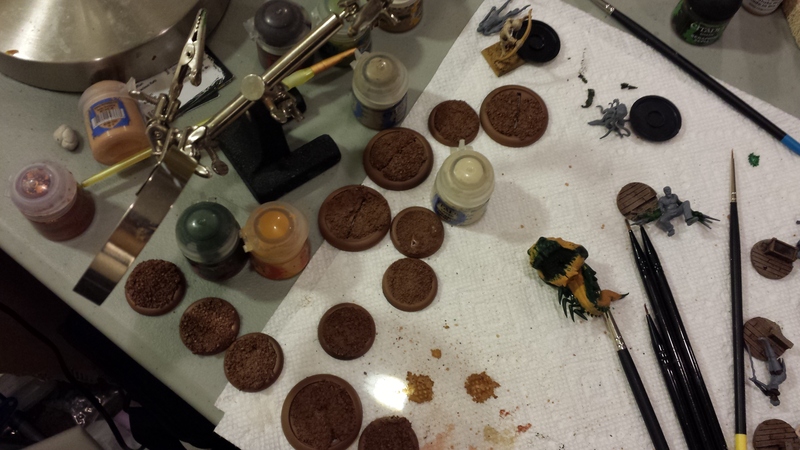 Bases for the two full crews already pictured. I’m really glad that I took that last picture, because it let me realize I hadn’t actually set up a base for the Rail Golem. I’ll have to prime it tomorrow, but I’ve thrown one together and it’s otherwise good to go. I think I’ll wait on Hamelin’s bases until I pick up some black spraypaint, and they may be my first swing at some water effects. Otherwise I’m keeping stuff simple, as most of my crews are being based in a general Old West desert. 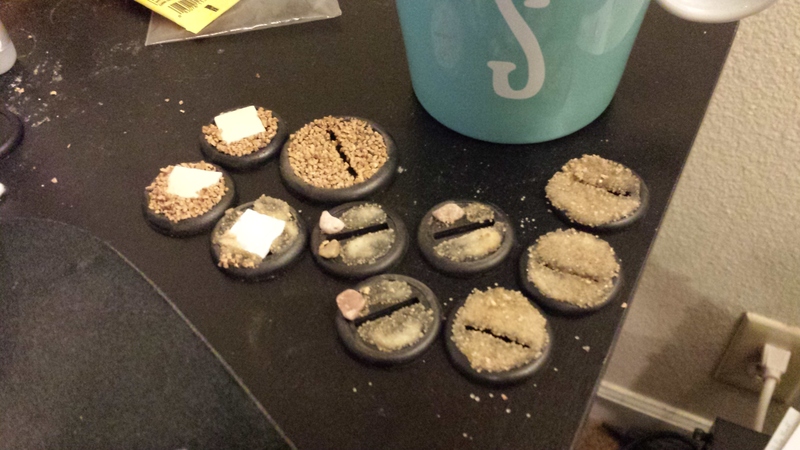 I’m partially going that direction because I don’t love painting bases, but also because the Old West elements of Malifaux are my favorite parts of the setting. You can see, on the right side of the last picture there, that I already picked up a few of the Malifaux bases (Ghost Town, to be precise). Those were fun to paint, and they’re the first base inserts I’ve ever done anything with. However, they’re also metal, and I don’t love working with metal. 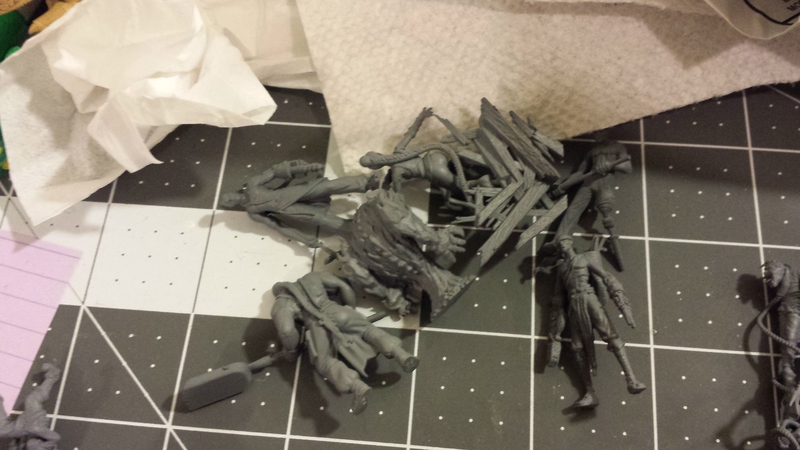 I may look into some resin inserts for future modeling, but I feel that getting a hand at basing is a necessary part of the hobby. Beautiful Green River in happenin’ Sweetwater County! So that helps to explain why I’m drawn to the whole Rail Crew, as well. Hunting out that picture, though, was a nice reminder that the desert’s actually pretty colorful! I’ll work to bring that out in the bases in at least a gentle, subtle way. I do plan on working some graffitied details onto the Rail Golem, and primed him with the Beast Brown so that it’ll be easier to suggest weathering and wear across the model. The fact that he came out a touch pigeon-toed also plays into the impression of his being an older, banged-up construct. The primed-up crews were put together over the last week; I’ve gotten into the habit of just priming things gray primarily (ha!) because that’s how Mrs. Ego likes her models done. 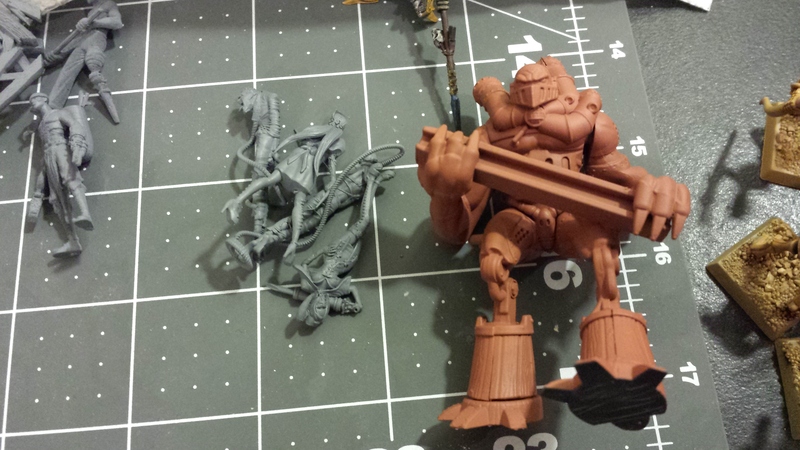 I still experiment here and there, and for bulk jobs I generally push for something that will better suit the final product—as seen on the skeletons in the corner of the Rail Golem picture. I also have an all-metal Hamelin crew, including Rat Catchers aplenty; I think I have two still in the box somewhere. No Rat Kings, though. I think I’ll probably just ‘bash some of those out of greenstuff and plasticard, trying to get as close as possible to the image from the cards. I love that whole crew’s aesthetic, which manages to convey more genuine horror and menace than anything I’ve seen out of 40k. I may only get in one game tomorrow, but I still plan on bringing a couple of different crews: Mei Feng and Mr. Lynch are definite attendees. I’ll bring Ironsides too, since I don’t have any extra models for her crew and can thus easily run her at low point values. I’ve considered taking Tara, but unless I know we’re going to pull a long-haul night I don’t want to bring the crew that I barely understand and use her to try teaching someone else the game! The lighting in the basemen of the game store doesn’t play well with my meager photography skills, but I’ll put in a decent effort at some battle reporting. Posted in Hobby, Malifaux.Tagged Basing, Hobby, Malifaux, Painting.